UNITED NATIONS, December 18, updated -- Following his mediation earlier this year of the violence in Kenya between supporters of Raila Odinga and Mwai Kibaki, Kofi Annan for months has been scheduled to provide a report and briefing to the Security Council. Inner City Press on Thursday asked outgoing South African Permanent Representative Dumisani Kumalo why it hasn't happened, if it had to do with the UK and U.S. taking different positions on Kibaki and Odinga, respectively. Ambassador Kumalo agreed, and said that the Council only works with all of the Permanent Five members agree, if then. Video here. Kumalo gave Sudan as another example, and might as well have mentioned this year's war in Georgia. At that time, Russian Ambassador Vitaly Churkin questioned the objectively of the UN's own reporting, by "the American" Lynn Pascoe of the Department of Political Affairs. Inner City Press asked Kumalo whether in his experience the UN Secretariat is also dominated by the Permanent Five members of the Council. Kumalo recounted that he was required to intervene before the release of a particularly one-sided UN Secretariat report. It later emerged that he was referring to a report on Western Sahara, in which France on behalf of Morocco exercised undue influence. Kumalo described a situation in which the Council's "lead countries" on African conflicts are not themselves from Africa, but are the "former colonial powers." He gave France's management of all things Chad as an example, and said that when he was in Chad this year, he asked "what are we doing here?" Inner City Press was along for that trip, and the degree to which Council members were asked to defer to France's views on Chad, including cover-up of human rights abuses there, was striking. Ironically, Chadean President Idriss Deby declined to even meet with the French-led Council delegation, despite having returned in time from a trip to Libya. The echoes of that confrontation with the press corps continue to reverberate. Footnote: In fairness, the South African mission too, at least on Thursday, had some issues with the press. After Kumalo's press conference, a reporter who had asked about "Mbeki's failed mediation in Zimbabwe" was challenged by a South African diplomat visiting the UN Mission. "I challenge your credentials as a journalist," he reportedly said. Inner City Press asked him about the incident, and that more apologetic approach taken in response is now anticipated. As Kumalo would be the first to say -- and may in the book he is said to be planning -- none of us are perfect. 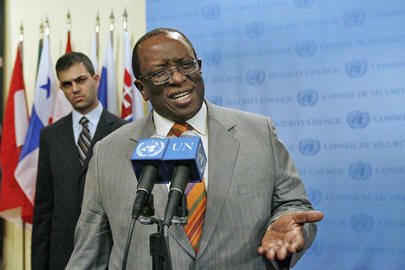 It's said Kumalo will be leaving his country's foreign service in early 2009. As he said during the press conference, in predicting that U.S. policy will not change much under Obama, he has lived in the U.S. a long time. Some predict he will stay here, perhaps seeking and landing a job with the UN. We'll see.